For many, it’ll come as no surprise that the findings also showed a significant drop in traffic from Page 1 to Page 2 results. Page 1 results garnered 92 percent of all traffic from the average search, with traffic dropping off by 95 percent for Page 2. 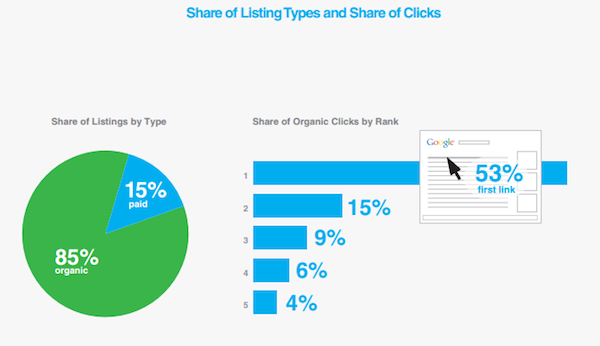 And whether you’re on Page 1 or Page 4, Chitika reports the top position consistently sees more traffic than others on the page. On Pages 2, 3 and 4, traffic dropped by 27 percent, 11.3 percent and 5.4 percent respectively from the first position to second position. For more information on Chitika’s methodology for this study, you can download the full report here. Understanding what any one ranking means to your SEO campaign in terms of traffic and conversions is the key to unlocking that ranking’s value. So while studies like these can be important in educating stakeholders for buy-in, use the data wisely. Work to understand the methodology of these types of studies, and use your own expert insight to extract how this data can reinforce the work you’re doing as a marketer.